Tomorrow is my husband's birthday. He doesn't really like cake and I don't particularly like making cakes, so I decided to make a Coconut-Macadamia Nut Bread. Quick breads are so easy to make a freeze well. You can pull out a slice from the freezer, pop it in a toaster oven, spread on some vegan butter and enjoy anytime. 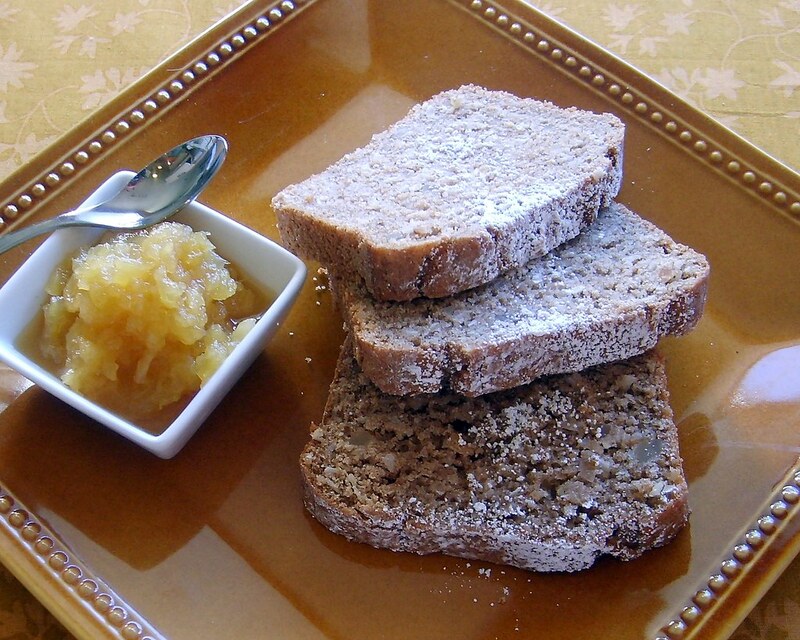 I made a quick pineapple jam to go with the bread, but any jam will taste good. This will be perfect on Saturday morning with a cup of Green Tea and of course the newspaper. Preheat oven to 325 degrees. Place coconut on a sheet tray and toast for about five minutes tossing every minute until lightly golden brown. It may take less or longer depending on your oven, but be careful not to burn. You can toast the macadamia nuts at the same time on a separate sheet tray. They will take longer about 10-12 minutes. Toss frequently to prevent burning. Increase oven temp to 350 degrees and place rack in the middle of the oven. Spray a standard loaf pan with canola cooking spray and dust with flour, set aside. In a large bowl, sift flour, baking powder, salt and cinnamon together. In medium size bowl, add egg replacer and water and whisk until smooth. Add maple syrup, canola oil, vanilla extract, lemon zest and coconut milk and whisk again until combined. Pour wet ingredients into dry ingredients and stir together with a spatula until combined. Fold in toasted coconut and macadamia nuts and pour into the loaf pan. Do not fill the pan completely to the top--leave at least one and a half inches for rising. You may have some batter left over--because loaf pans vary in size. Place pan on a sheet tray and bake for 30-45 minutes, depending on oven. Check at 30 minutes for doneness. Let cool on a rack for 15 minutes before removing and let cool completely before cutting. Sprinkle with a light dusting of powdered sugar if desired. Drain juice in a small sauce pan and coarsely chop pineapple. Add chopped pineapple and agave syrup to juice and bring to a boil. Reduce heat to low and simmer until thick, about 15 minutes.